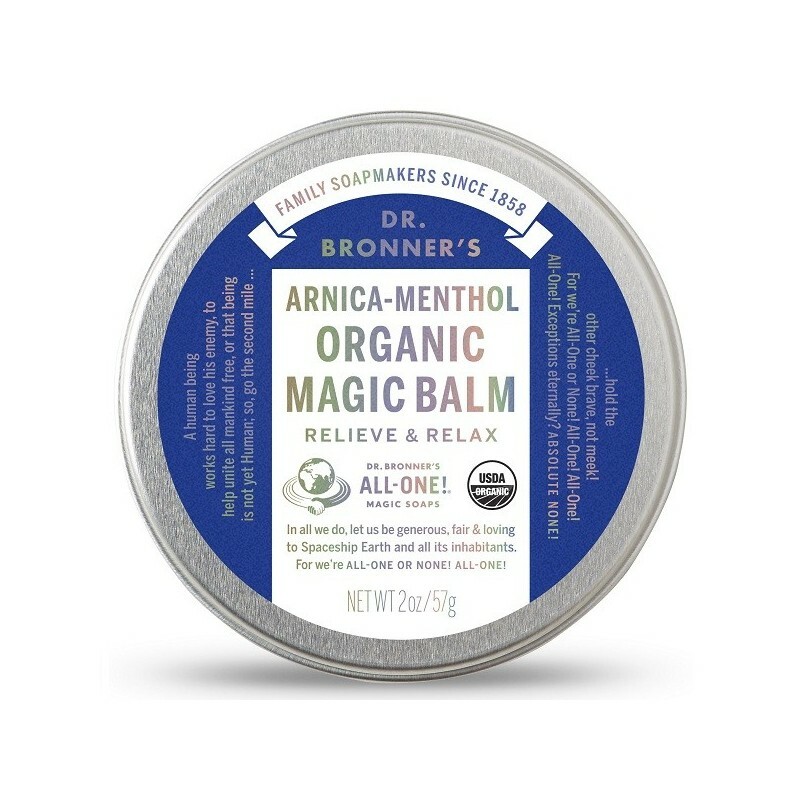 Arnica-Menthol Organic Magic Balm helps cool and soothe sore muscles and achy joints with a potent blend of arnica, camphor, menthol and peppermint oils. Massage gently into sore muscles – arms, legs, chest and back. Menthol-Peppermint scent. 57g. Dr. Bronner's is committed to providing earth-friendly, toxin-free, all-natural cleaning solutions for the home and self. Using natural cleaning products that contain no preservatives, detergents and foaming agents is better for you and for the environment. Certified Fair Trade - Fair For Life. Base of organic beeswax and organic oils – avocado, coconut, olive, jojoba and hemp to nourish and moisturize skin with no synthetic ingredients. Massage gently into sore muscles – arms, legs, chest and back. Ethical sourcing - Dr. Bronner's provides detailed and honest disclosure of where they source the ingredients in their products, with info regarding fair trade certifications, work and farming conditions, sister companies, and more. Certified organic to USDA National Organic Program. Persea Gratissima (Avocado) Oil,*† Cocos Nucifera (Coconut) Oil,*† Cera Alba (Beeswax),* Mentha Arvensis (Peppermint) Oil,* Olea Europaea (Olive) Oil,*† Cinnamomum (Camphor) Oil,* Mentha Arvensis (Menthol) Crystals,* Simmondsia Chinensis (Jojoba) Seed Oil,* Cannabis Sativa (Hemp) Seed Oil,* Arnica Montana Oil,* Mentha Piperita (Peppermint) Oil,* Tocopherol. * Certified organic. † Certified Fair Trade. Browse our other balms here. I received this product one week ago and I find it effective. I'm using this balm on my arthritic hands and I noticed the difference. it eases the pain. I will buy this product again and also recommend to my family and family. Really nice and soothing feel and scent. Not going to help injuries though or actual muscle pain. But definitely still like using it. I found this to be effective in providing some relief for muscle aches and I really like the minimal packaging and ingredient content.